Join us for this webinar reporting on the findings of the recent Third Party Management Survey conducted by OCEG and Thomson Reuters. This is a recording of a previous event. There may be references to future events, special offers and free downloads that are not available at this time. Do you think about how effective you are at addressing key risks in your third party relationships? Do you want to know what your peers see as priorities in their third party strategy? Do you want to understand the impact of regulatory guidance and available technologies on your third party management program? 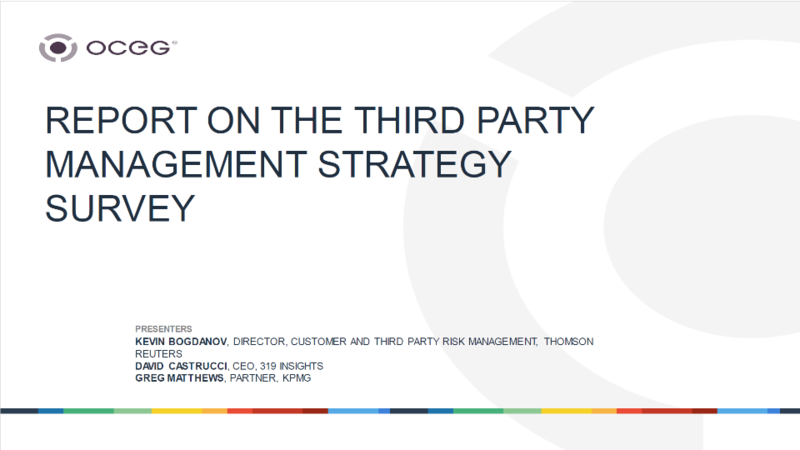 Then you should join us for this webinar reporting on the findings of the recent Third Party Management Survey conducted by OCEG and Thomson Reuters. In addition to discussing the survey findings, we will review what regulatory guidance from PACI, ISO37001 and the DOJ mean for firms, and how data and technology play a critical role in supporting and optimizing best practice third party management programs.